No trip to Music City would be complete without a visit to the area of Lower Broadway between First and Fifth avenues, a landmark district known as the Honky Tonk Highway. A honky tonk is a laid-back watering hole where locals gather to hear live music. When the Ryman Auditorium became home to the Grand Ole Opry, many performers would cross the alley behind the building and enter these venues through their backdoors. It was a common sight to see headline acts performing alongside local bands. These music venues were also the places where many future stars were discovered. You can stroll down the street and hear a wide variety of music emanating through the open doors. Featuring walls lined with a variety of memorabilia, honky tonks typically open late morning and stay open until the wee hours the following morning. The music is always live, and there is usually no cover charge. The performers are paid from tips that patrons leave on their way out. The festive atmosphere is open to all ages during the day. 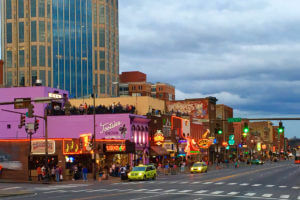 Because the over-21 age limit is typically not enforced until 7 p.m. or 8 p.m., honky tonk-ing is one of the popular Nashville things to do that family members of all ages can experience during the day while visiting the city. A staple of Lower Broadway for decades, is the place where Willie Nelson earned his first songwriting gig. The club has hosted nearly every singer and songwriter in the industry. A clothing store by day and a music club at night. It features traditional country, rockabilly and bluegrass music. Filled with Grand Ole Opry memorabilia. Performers are known for playing old school-style country music favorites and original works. Features a large dance floor and a massive mural adorned with the images of Willie Nelson, Waylon Jennings, Johnny Cash and other celebrated performers. With unique guitars displayed in the bar, the venue has a Texas-style atmosphere. Offers free dance lessons on the largest dance floor in the city. Housed in a repurposed, historic warehouse, the three-story club has Southern cuisine and several stages hosting a variety of acts. Located approximately a mile from Lower Broadway in the Gulch neighborhood. 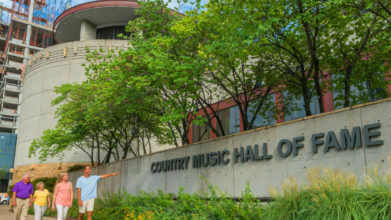 It is regarded as one of the top venues for bluegrass music. An intimate venue in the Green Hills neighborhood. Popularized by the hit television show “Nashville,” it has left a major imprint on the city music scene. Garth Brooks and Taylor Swift both got their start at the Bluebird Café. Offers country music along with rock ‘n’ roll with three stages situated on its two floors. The outdoor patio provides amazing views of Broadway. As the sun sets on Lower Broadway, the bright neon lights of the popular music district beckon revelers with the promise of late-night excitement. Steeped in country culture, these clubs offer the possibility of a guest appearance by a legendary performer. You can enjoy the boot stomps, slow dances and sing-alongs. 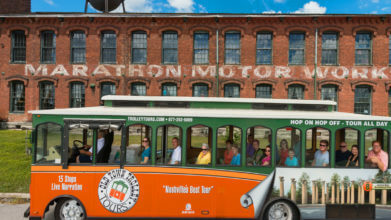 Join the fun on an Old Town Trolley “Soul of Music City Night Tour”. Led by a talented guide, you can explore different musical genres and learn intriguing facts about the people, places and events that made Nashville famous. You will even spend time in one of the city’s best-known honky tonks for a close-up view of the fun and excitement. Featuring historic roles in country music and distinctive quirks, honky tonks are located throughout Nashville. They attract college students, hipsters, locals and out of town visitors who want to enjoy a slice of country music. Offering something for everyone, honky tonks should be included on your itinerary of Nashville things to do.